We are very proud to announce our first collaboration - and we feel it is so appropriate that the collaboration is with one of LUC.’s very first suppliers LUMIRA. Founded by Almira Armstrong in 2013, Lumira is the manifestation of a life-long affair with beautiful objects and the differences small details make to our everyday lives. The power of fragrance to trigger the senses, a memory and even a person's emotional state are the inspirations that led to the creation of the Lumira brand. Infused with the highest quality fine fragrance oils reminiscent of places both near and far, Lumira's luxury lifestyle essentials are a celebration of beautiful scent, sophisticated design and the spirit of travel. So, we proudly welcome DUBH. by LUC. Dubh. is the Gaelic word for black. The fragrance is dedicated to the beauty of Ireland, where LUC. founder Lucy Given was born, and the heritage of Tasmania. It is an intensely dark and earthy scent with remnants of Tasmania’s natural forests, cold nights, open fires and clean, crisp air. Our store is synonymous with the colour black, with the edit of our design products, the selection of our fashion range to the colour of our walls. The colour resonates luxury and mystery for owner Lucy, so it was only fitting the candle reflected this. "Tugging at its moorings under the giant clouds of the Roaring Forties, Tasmania is different: we are no longer in Australia. All colours have the glassy intensity of a cold climate: the greens greener, the dark blue of the numberless hills and mountains appearing almost black"
We are thrilled to announce that LUC. will be the new supplier of Armadillo & Co. rugs in Hobart. Armadillo & Co is inspired by collaboration, a search for the uncommonly beautiful, and most of all, the human touch. All of their products are infused with the rich history and artisanship of the hands who have created them. They are passionately committed to social responsibility and community involvement. "Our vision to establish a company committed to ethical production gained momentum after seeing an opportunity in the market for simple, handmade, quality rugs. We fervently believe in the cornerstones of our brand. Our commitment to social responsibility, sustainable practices and to helping to support the community of artisans who hand make all of our products is what separates us from traditional rug manufacturers and retailers." We have the full sample range in store and look forward to helping you decide on one of these exceptionally beautiful rugs. They carry stock sizings in all their rugs and any of the designs can be custom made to fit any room. Apologies for any inconvenience we are working on a new online store - so please be patient, we will be back soon with a bigger and better online shopping experience. Please contact our store directly if you wish to purchase anything whilst we are working on the new online store! hello@lucdesign.com.au or (03) 6224 1610. We will be open for limited trading hours this Easter holiday. We look forward to seeing you in store! We have been working toward having this brand for some time, so obviously we are super excited to be receiving our first (albeit small) order coming through later this month. We will be starting with some of the better know pieces - including the Bourgie light - it is simply one of those great iconic lights and we know quite a few of our customers have been coveting one - glad to be of service! We are happy to take pre-orders for anything in the range, and will be slowly adding to our in store stock over the coming months. We are THRILLED to announce we have won Retailer of the Year 2018 at the recent Life Instyle GALA awards held in Sydney. We are so excited that our little Hobart store has once again be recognised as a National leader in retail - and we were so honoured to be amongst some of the most awesome company in the finalists. It was such a great night, and made even more special for me to share it with my staff. We work really hard to make LUC. Design a unique and beautiful destination in which to shop. But most of all we love creating a space that inspires our customers to really embrace great design and make it part of their life. To be recognised for that is so special, thank you! We are super excited to be finalists in the GALA awards 2018 on 24 February - wish us luck! We are so honoured to be a finalist in such awesome retail company from around Australia. Lucy will also be presenting at Life Instyle this February in Sydney - and we would love to see you there. Talking all things VM and store design. (Click here for tix) or on the Life Instyle Website. Goodbye 2017.... it's been great!! What an amazing year it has been at LUC. Design. From awards, to travel, to meeting inspirational designers and design heroes, to bringing new and exciting global brands to Hobart. At the beginning of the year we were honoured to be chosen to represent Australia in Chicago at the Global Innovation Awards - and there we were blown away to win the Martin M Pegler award for Visual Merchandising. This honour came with the added bonus of meeting inspirational retailers from all over the globe and making contacts that have been invaluable in the growth of our business. 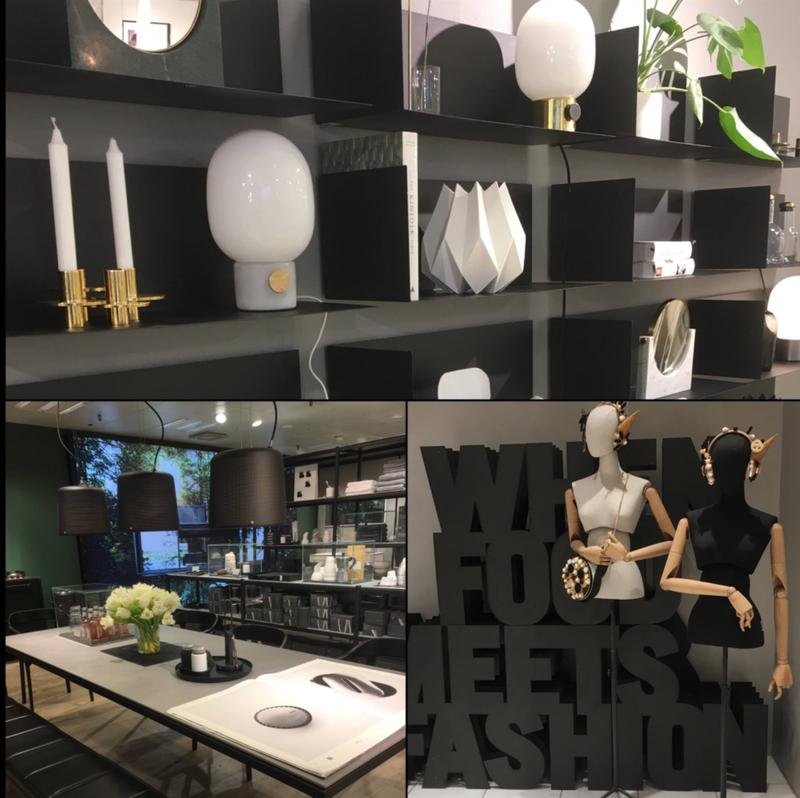 I was fortunate enough to visit many of my suppliers in the UK and Denmark and then went on to be totally inspired by my first visit to Salone del Mobile in Milan. I was part of the launch presentation of Tom Dixon's new products and basically the whole Milan experience made me so happy to be involved in this industry. We refurbished the store, making it feel larger and more open (and we added new areas to highlight our best sellers) the new more open space has now enabled us to expand our brand representation and we welcomed new mega brands Alessi, VIPP and Cire Trudon. We proudly and enthusiastically represent all our brands, and have added some beautiful new designers into the store - Utiopia and Utility, Plyroom, Aplin Creative, Bruzzoni amongst others. We happily welcomed our newest member of Team LUC. 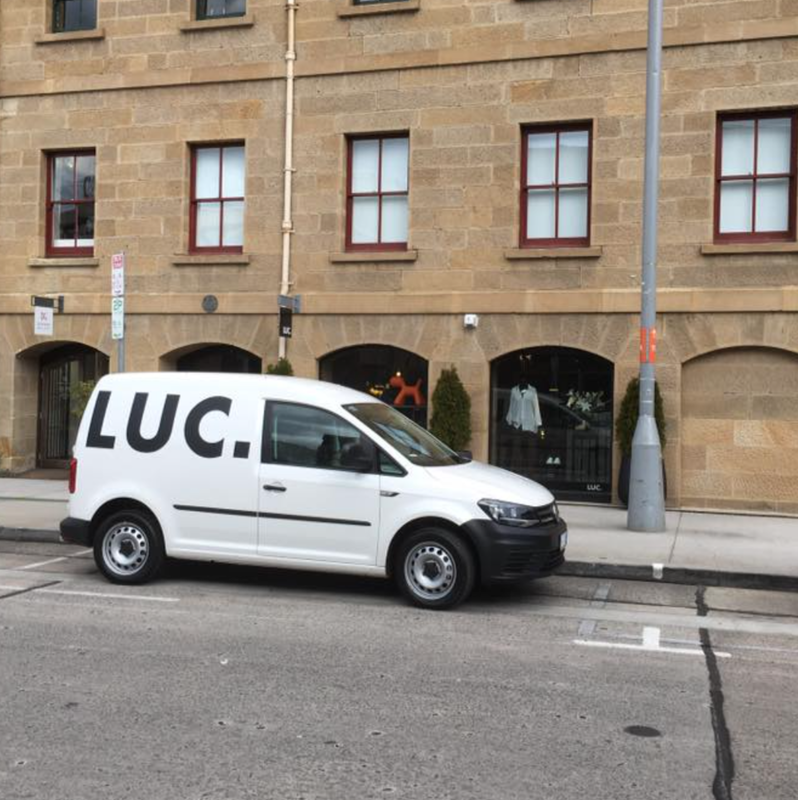 - our awesome little delivery van CaddyLuc!! This has made our lives so much easier and made our customers super happy by offering free delivery of our great product! 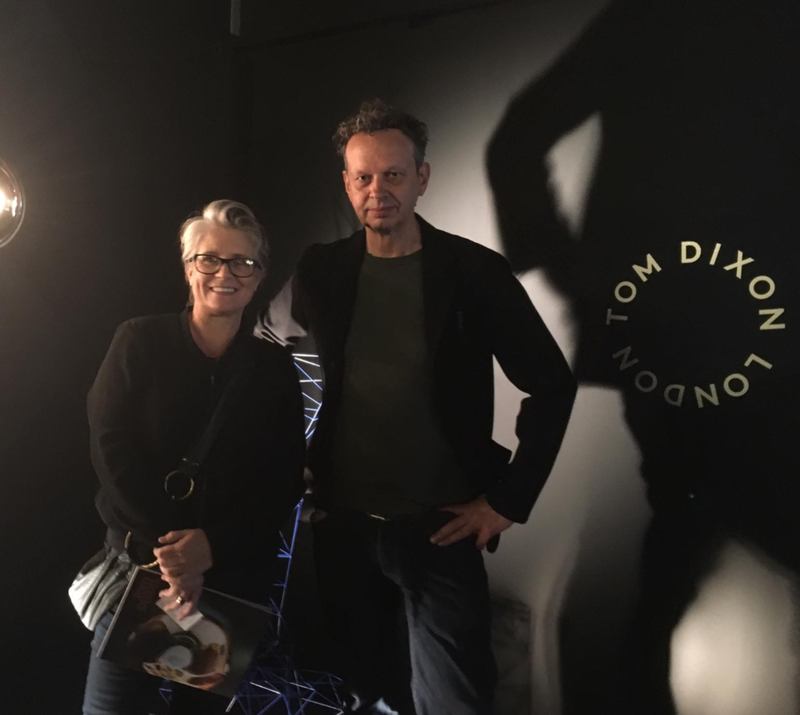 On a personal note, I was so honoured to be asked to interview my design hero Tom Dixon on his recent trip to Australia. I was also challenged to make presentations at Life Instyle and Reed Gift Fairs (public speaking is not my forte!) - I am scheduled to do more of these in 2018 which I am excited about. We have plans in place for some great in-store promotions and presentations, we have some incredible new brands brewing in the wings and once again, we are finalists in the GALA awards for best Homewares Retailer of the year. Lots to look forward to! So good bye to one of the most amazing years, but hello to all the possibilities and growth that 2018 will bring. Thank you so much for following us, thank you so much for supporting us and THANK YOU for being part of the LUC. journey. I am so thankful for my amazing staff, and so grateful to all our great customers - without whom the journey would not be possible. Tom Dixon was in Australia this week to work and speak on his new project - the proposed AMP Quay Quarter Tower in Sydney’s Circular Quay. Tom Dixon's interiors studio (Design Research Studio) will be designing the lobby, reception, meeting and conference facilities. Taking advantage of this brief Australian visit, DeDeCe (the Australian distributor of Tom Dixon products) organised presentations in both their Sydney and Melbourne showrooms. I was fortunate enough to secure an exclusive interview with Tom, and we sat down in the beautiful, modern surrounds of DeDeCe's new Richmond showroom space. Our casual chat covered everything from his accidental journey as a designer, his design projects and plans for the future. LUC. As a reseller of your product, the question I am most often asked is who is Tom Dixon. What would you like me to say? TOM. That's a big question! Tom Dixon, the brand, is majority owned by private equity, so in a sense I am a part owner of myself, which is an odd situation to be in. The thing that is interesting for people is that I'm putting my own narrative of unique ideas and intellectual property under my own name. This arrangement is typical in the fashion industry, or for a fashion designer, but no one is doing it in product design. This has made me kind of stick out, we stand out. There are days in the office where I will hear the team saying "that's not very Tom Dixon, we can't do that" and at some level that is very disconcerting. I am sometimes in a semi-detached state, the control has passed - this is a construct of my own making. It's interesting to do things that others aren't doing - it motivates me. Working and collaborating with other people is what interests and motivates me now. LUC. So who do you design for? TOM. I do it for my own pleasure, although it has become a bit more of a machine. The infrastructure of the business has grown to such a scale now that, in principle, I can get back to what I was originally doing. We now have approximately 400 to 500 objects, we have distribution infrastructure sorted, we have stores in London, New York, LA and Hong Kong. and an established product development team. In theory, I shouldn't have to throw so many ideas into it, I can now experiment more vigorously with things that interest me. I love trying something new that I am not yet good at, it still feels like a hobby to me. It interests me - the idea of designing product that people want to buy. The idea of design vs commerce. This distinguishes us from a lot of other design firms. A lot of designers do it theoretically, and pretend to be less interested in the idea of their product selling. To me, the product selling legitimises what I am doing. It fascinates me, that I can design product that people want to pay cold hard cash for. There is a joy in that, there is job satisfaction from seeing it through from concept through to reality. LUC. Your work is mainly in metals and glass and the brand's products reflect this, and yet Tom Dixon owned Artek for 5 years, a Scandinavian brand recognised for it's timber products. Is there a reason why you haven't produced more timber products? LUC. the reason I ask specifically about wood is that I am becoming more involved with our local designers in Tasmania, where a lot of the design is being produced in timber. I was interested to know why Tom Dixon hadn't gone down that path. It is a difficult thing for them to be competitive, as manufacturing in small quantities is expensive and yet 'mass production' has negative connotations to a craftsperson. TOM. I believe we are entering a new industrial age right now. The line between beautifully made and hand-crafted and industry is becoming blurred. The combination of using advanced digital tools but hand finishing pieces is going to become the future. There is a new world emerging with digital printing being more accessible. It has happened in the graphics and music industries and we are now seeing it with 3D products. There will be less of a distinction between mass produced and artisan produced. We are now so far advanced with marketing and photography, with distribution that reaching a global marketplace is now much easier. So it shouldn't matter whether you are producing in Tasmania or Shenzhen. Tasmania will become much less remote which will mean being more of a global player. LUC. Was there a 'tipping point that launched you or your brand into becoming the global player you are now? TOM. Not really, there was a series of events or stages that occurred. I moved from my own studio work to sending designs to Cappelini. The late 80s and early 90's were transformative from being a self-producer to then accessing the global furnishings market. I gained experience in the luxury product market - having access to the large furniture fairs, getting experience in distribution and manufacturing. Joining Habitat and not designing for 10 years was a very big lesson for me, in a very different area - in design management, retailing, communication and global sourcing. Very few people have access to all these experiences, I was very fortunate. I also think the music business affected the way I do things. The idea that anything is possible if you learn stuff yourself, just by practicing enough. LUC. What still excites you about design? TOM. To be in a position to have a point of view on new categories, or new objects. Aesthetics may change or production techniques, but I still get excited by shapes. It is nice to work within our framework but explore new shapes and materials. Doing design, as opposed to art or sculpture, gives you a formal framework. It’s expected that the product will have a degree of function, and I feel more comfortable with a certain restriction. It’s got to hold up, it’s got to pour, it’s got to illuminate for instance. I am currently working on a pet project in the Bahamas where I have designed a system where I’m growing underwater furniture. It’s a half-conceptual, half-sustain­ability project. I discovered a 1970s scientist who tried to grow artificial coral to make cities that floated underwater. It never worked, obviously, but I’ve transferred the idea into an underwater furniture farm. I have a solar panel at the surface which feeds electricity down to a metal chair, which over time, will grown a layer of coral/calcium deposit. - and create not only a new ecosystem but a unique and valuable end product. That’s something I’m fiddling around with, maybe that will be my retirement plan?! LUC. What's the ultimate collaboration? TOM. The one I haven't though of yet! I don't know...maybe power tools? toasters? motorbikes? electronics? I wanted to design a coffin with IKEA but they weren't convinced, so we ended up producing a bed that could convert to a day bed or love seat, I am definitely moving towards architecture. The Design Research Studio - the interior design side of the business is only about 1/10th of the business in terms of turnover but it has proved a very good laboratory for our products. The product side of the business is scalable and manageable but to increase the architect and design side will mean building a much bigger infrastructure. LUC. Which is the bigger compliment, innovator or iconic? TOM. Definitely innovator. Being iconic is somewhat loosely used now, and also a term that is in the eye of the beholder. You would never consider calling yourself iconic! Being innovative means no one has done it before - that is so much more interesting. It goes back to what we were talking about in the beginning - these days sometimes it is hard to distinguish between brands. The idea of using a whole stable of designers to create the brand is problematic - you don't see it in the fashion industry. Italian design in the 60's was renowned for using a single creative director and holding the aesthetic, and I think this is more interesting way to operate. After thanking Tom for his time, we went on to talk about Tasmania and his desire to visit MONA. He had heard a lot about the unique Museum in Hobart, I described the great architecture and design details from within the space. It led us to talk about the concepts he was working for the new lobby project in the Quay Quarter Tower - he wants to introduce elements of the Australian landscape - paying homage to the below-ground rooms found in central Australia and to the raw finishes and colours found in that landscape. So, with an ongoing project now starting in Australia, we will look forward to (hopefully) welcoming him down to Hobart next time he visits! What a week we have had! New brands, new stock, and the good news keeps on coming! We found out this week we will soon be adding yet another classic brand - Alessi - to our LUC. stable. This iconic Italian design house started in the 1920s and is now considered one of the leading Factories of Italian Design. Renowned now for their collaborations with some of the world's leading designers including Philippe Starck, Michael Graves, Aldo Rossi, Frank Gehry, Marcel Wanders, Ron Arad, and David Chipperfield. Not to mention great Australian designer Marc Newson - the brand elegantly combines high quality craftsmanship with mass production. They also have a strong commitment to corporate social responsibility and are involved in a series of local and international charitable projects. We feel that this brand will fit well with our brand commitment and philosophy and with many different price points within their range of homewares we know you will find something that will either work for you or make the perfect present -from whimsical pieces to super practical essential kitchenalia - and with Christmas coming the timing could not be better! LUC. welcomes VIPP to our store! When a brand totally aligns with your design philosophy you have have no choice but to stock it in your store! Enter Danish super brand Vipp - the ultimate in Buy Once Buy Well product. Established by Holger Nielsen in the 1930's, after Holger's wife Maria asked for a bin to be manufactured for her beauty salon. That original bin was the beginning of a long line of extremely well-made product - the original shape almost unchanged today. From beautiful homewares, bathroom and kitchen accessories to complete kitchens and even a pre-fab modular house this brand is all about quality and simplicity. Pared-back forms, quality products and 10 year warranties are intrinsic to the sense of style and longevity. So 'on-brand' with LUC.!! I have been wanting to stock this brand for so long, and this month we receive our first shipment of the timeless homewares. These pieces are definitely something you might like to include on your Christmas wish list! We represent designers and their products because we are exceptionally drawn to their work - not because they are the 'flavour of the month' or because their product is 'on trend'. Well, when we heard that Brodie had been chose by Microsoft to feature as the 'face' of one of their new products we could not have been happier. To be recognised by one of the world's leading technology companies in your own field of excellence is massive. I imagine his profile will now sky rocket and my advice would be to invest in one of Brodie's pieces quickly! Cire Trudon comes to LUC. This month we welcome the world-renowned candle house Cire Trudon to the store. Founded in 1643, Cire Trudon is the oldest candle manufacturer in the world and each votive is still dripped and made by hand. Referencing its rich history, the brand creates enchanting scents inspired by biblical passages, kings, revolutionaries and Château de Versailles - where it once provided light for the courts of Louis XIV and Marie Antoinette. The candles are manufactured with their unique blend of waxes at the Trudon factory in Normandy. The wicks are 100% cotton and are adapted specifically to each fragrance according the their burn characteristics. The one-of-a-kind glass vessel is made by artisans in Vinci, Tuscany and no two glasses are the same. The beautiful gold emblem on the candles is made by one of France's oldest champagne houses and is inspired by a bas relief found at the old Royal Wax Manufacture which used to belong to the Trudon family. Situated in Antony, near Paris, it now belongs to the Church. Nowadays the domain hosts the nuns of the Saint-Joseph de Cluny congregation. We have our first delivery of the classic candles, together with a selection of the beautiful room sprays, in store now and we expect more stock at the end of the month. LUC. Design wins global award! 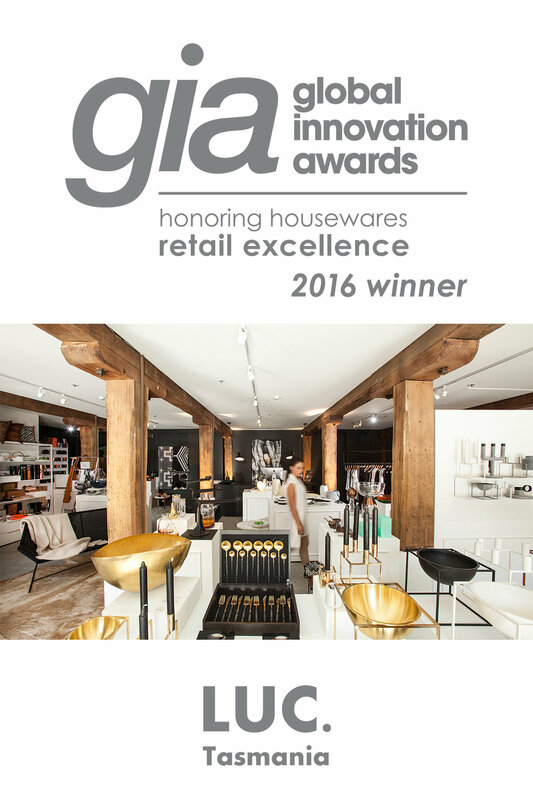 We were blown away to see our store presented at the Housewares Fair as the GIA Australian winner - it was so cool to see the other amazing stores from around the globe - all incredible examples of retailing excellence. We are beyond thrilled to announce that LUC. Design has won the Martin M. Pegler award for Excellence in Visual Merchandising held at the Global Innovations Awards in Chicago. This is an amazing honour - and I was lucky enough to receive the award from Martin Pegler himself - such a huge privilege, and we are overwhelmed that our small store from Tasmania is now recognised as a GLOBAL WINNER!! What an amazingly exciting experience and I am so so grateful to be the Gift Guide Australia, GIA, Life Instyle and Reed Gift fairs for this incredible honour. We are off to CHICAGO!!! Well let's start the new year with some really BIG news! Australian retailer that ticks all the boxes in terms of store presentation, visual merchandising, social media and brand identity - this year we are thrilled to announce that LUC. has won! We will be heading to Chicago in March to represent Australia at the Global Innovations Awards where 5 global winners will be chosen - wish us luck! Such an honour and so exciting. I am so proud of my team and the store we have created. Tasmania is a small State and it is always a challenge in any retail environment to be competitive and unique, I sit amongst brilliant retail stores in Hobart and we all punch well above our weight in regards to stock and presentation - we also have to compete with online stores both nationally and internationally - we feel an extra achievement when Tasmania is a winner! I have awesome suppliers and much of the success of the store is due to the support we have received from these great distributors and major brands. But mainly we just love what we do. We love this store and the brands we carry, so we hope that passion comes across. And we want to inspire you to love great design and make beautiful objects part of your everyday life. Well here we are - the pointy end of the year. Such an enormous year at LUC. and we are now gearing up for the best ever month in our store. We love this busy time of year. We love wrapping your gifts (and knowing the secret presents our lucky customers are going to receive!). We are thrilled that the new Tom Dixon ranges have arrived ready for our Christmas trade. These new Tank designs are just stunning. Huge vases (the biggest at almost 1mt tall! ), lanterns, serving bowls, tealight holders, ice cream bowls and even a remarkably beautiful cake stand. The (beautiful) marketing photos from Tom Dixon simply don't do the range justice as you cannot imagine the scale and simple pleasure that the glossy finishes provide. We are proud that LUC. has become the go-to destination for beautiful, special gifts and this year we really have some exceptional pieces that will satisfy even that person on your list 'who has everything'! Once again this year we have teamed up with the lovely girls at Fly Wheel in New Norfolk to supply the stylish, simple, quality gift cards from their Christmas letterpress range. Every gift we wrap this year will have one of their beautiful tags attached. We look forward to seeing you in store - MERRY CHRISTMAS!! Lucy and the team at LUC. LUC. welcomes back one of our favourites! Just in time for Christmas trade we welcome a restock of one of our favourite Danish Brands RO. We have stocked this brand since the we opened our first store and their product consistently delights with it's classic style and beauty. In this shipment we have included some new pieces in addition to their beautiful (and best-selling!) hand-blown vases. We love the look of their wooden objects - you can use these to present salt on the table, store jewellery or just has sculptural pieces in your interiors. We are also seeing for the first time their ceramic range - triangular shaped vessels for the table. Different sizes and glossy finishes we are really looking forward to seeing these pieces - and are confident they will look sensational on your table! We really love this brand and are super excited to see their new pieces, we hope you will be too! We have been busy busy busy in store with the slow awakening realisation that Christmas is actually not too far away. Seems our customers are more in-tune than us! So many beautiful new things in store - loads of new classic fashion pieces from Lounge the Label and Acler and new furniture and homewares from Woud and Menu to name just a few. But the REAL buzz in store is that we are a finalist in the Life Instyle GALA awards for Retailer of the Year. Shut the f...ront door....SO cool! The awards represent such a great selection of serious contenders so we are just really proud to be even nominated. We love our store and we love the reaction we get when people walk in, so it's such an honour to be recognised for making an impact on the retail scene. We are super excited to be adding a new brand to the LUC. stable. We are looking forward to our first delivery from Danish brand WOUD arriving around the end of this month. This high quality range of design furniture, lighting and accessories exemplifies the simplicity of Nordic style and creativity. Our first delivery will include seating and storage ideas and some of their accessories including wall hooks. We think this range will really appeal to our customers who like the Scandinavian look, and these pieces certainly have appeal with their simple, well-made, unique designs.